WOW, what a week! I am exhausted from all of the excitement! I found out yesterday that one of my cards is being published in Paper Crafts Magazine! Whoo hoo my very first card to be published! I feel like I am in a dream right now, let me tell you. 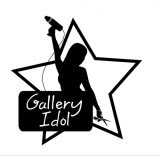 The greatest part about the Gallery Idol and being published is that I have a huge support system....all of you! Al, my parents and friends are wonderful don't get me wrong I need them more then you can know, but I do know they don't quite understand how much all of this means like you do. SO a big hug out to all of you for the personal emails and wonderful comments here. I love you all!! Thank you! OK on to the card, just some Scenic Route PP, black, white card stock, certainly celery & basic black ink all from SU, a large brad from MM and ribbon from Target's dollar spot. OH and of course my Sakura Souffle pens for some faux stiching and dots. The BFF sentiment is a cute stamp from See's D's. Alrighty gotta run, a million things to do. This card is too cute as well, LOVE the colors. Have a wonderful day! Congratulations Pam!!! I'll be over there voting for your cards!!! What a beautiful card Pam! FANTABULOUS CARD PAM! BEAUTIFUL COLOURS: YOU RULE!!! Your work is gorgeous. I can't believe this is only your first pub!